Chances are, your favorite tomato is a different variety than mine. When it comes to tomatoes, there is no shortage of varieties. As a matter of fact, there are over 10,000 varieties of tomatoes! There's big tomatoes, little cherry tomatoes, and in between sizes. You can choose between meaty or juicy varieties of tomatoes. Flavor definitely sets different varieties apart. And, not all tomatoes are red. As a tomato grower, we suspect (and hope) that you are growing several different varieties of tomatoes. Chances are, you will try many different varieties, and will seek out new varieties for your home garden. Thought for the Day: If tomatoes are technically a fruit, is ketchup a smoothie? Here are just a few of the hundreds of varieties of tomatoes that currently exist. We have grouped the types of tomatoes into major categories. Cherry Falls - Distinctively sweet cherry tomatoes, that are great in salads, on relish trays, or eaten fresh right off the vine. A great variety for hanging baskets. Chocolate Cherry - Indeterminate vines produce chocolate colored cherry tomatoes that resemble chocolate drops... round and perfect! Supersweet 100 Tomato - Amazingly high yields of super-sweet one inch fruit.Vitamin C content is higher than any other tomato. Disease resistant, indeterminate plants produce right up to frost. Grape Tomato - Small and bite-sized, these tasty morsels have gone from unknown to "the rage" in just a few years. These egg-shaped fruit are sweet and tasty. How to Grow Grape Tomatoes. Tiny Tim - This extremely miniature cherry tomato is perfect for small gardens and containers on your patio or deck. Fruit is 3/4 to 1 inch in diameter. On the Light Side: Why are tomatoes red? Because they saw the salad dressing. This type of tomato ripens the earliest in the the season. Gardeners cherish early season varieties. The first tomato of the season is a long anticipated thrill. It's a sense of gardening pride, to be the first in your neighborhood to produce a ripe, home grown tomato. Early season varieties usually are often determinate plants with smaller fruit, than mid-season varieties. Early Girl - By far the most popular tomato in this category. It produces tasty slicing tomatoes in as little as 52-55 days from setting starts outdoors. 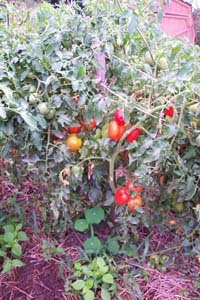 Indeterminate plants produce an abundance of four to eight ounce tomatoes very early in the season. Production often drops off, just as your main crop and beefsteaks begin to produce. Independence Day - Start these plants indoors, and you can have garden fresh tomatoes on the 4th of July. Matures just 55 days from setting transplants outdoors. Orange-red fruits are about 2 1/2 inches in diameter..
Best Boy - As its name suggests, it is better than better boy. This variety has the best taste, and is a beautiful, large, round. Disease resistant. fruit. Better Boy Hybrid is one of the most popular main crop tomatoes. Vigorous plants produce an abundance of extra large fruits, some weighing 1 1/2 pounds each. Many people claim this tomato variety has the best flavor. Meaty fruit is deep red in color. Big Boy Hybrid - One of the most popular hybrid tomatoes. Indeterminate plants produce large, deep red tomatoes, up to 2 pounds each. These big boys will produce right up to frost. Celebration Hybrid - The large, firm red fruit has exceptional flavor. Grows on determinate plants and is resistant to most diseases. Celebrity Hybrid - Celebrity is a star performer. Growing on semi-determinate vines, it is a dependable producer of large, firm fruit weighing about a half pound. Container's Choice Red Hybrid - This is the premier tomato variety for container gardens. Enormous yields on a bushy, space saving plant. Its perfect for your patio or deck. Oregon Spring - Medium to large fruit is tender, juicy and full of flavor. Determinate variety that is nearly seedless. Matures early. Rutgers - A favorite among home gardeners. It is unsurpassed for canning. Highly productive plants produce large, meaty fruit, with superior flavor. Plants are indeterminate. Jet Star Hybrid - This big yielder produces large, globe shaped, low acid fruit with a great taste. Indeterminate vine is vigorous and produces early. Manitoba - An excellent extra-early determinate variety that produces smooth, slightly flattened, brick-red fruit weighing about 6 ounces. An outstanding container plant. Tigerella - This indeterminate variety has unique, red and orange striped fruit that has a tangy, rich and delicious flavor. Tasty sliced fresh, or canned. Wisconsin 51 - An all-purpose tomato, favored for its sweetness. The fruit is large, red, and averages 8 ounces. Excellent for canning and slicing. These are the monster of the home tomato garden. These big, fat, juicy tomatoes are among the tastiest you'll find. One slice of these tomatoes, covers a piece of sandwich bread. They also take the longest to grow. However, all will agree that they are worth the wait. Beef Maestro - This indeterminate tomato plant produces large yields of deep red, firm, extra large beefsteak type tomatoes, that resist cracking and splitting. Beefsteak - grow a monster tomato in your home garden. Bush Beefsteak - if you're space limited, try this compact bush variety beefsteak tomato. An early variety with richly red, 8 ounce fruits. Giant Red Beefsteak - Grow one to three pounds apiece of flavor! One slice covers your sandwich. Hillbilly - Large, beefsteak-type fruit is an unusual yellow-orange color, streaked with red. 1 to 2 pound tomatoes are sweet, with high sugar content, and high acidity. Indeterminate plants. These tomatoes are smaller but meaty, and have less juice or liquid. They are popular for making tomato sauce, tomato paste and ketchup. Roma - By far the best known variety for tomato paste is Roma. San Marzano - Commercially introduced in 1926, this plum tomato was first brought to Europe from the Peru in 1770. Indeterminate plants. Viva Italia Hybrid - A tasty Italian type paste tomatoe. It has deep red fruit, and with a meaty flavor. High sugar and good acid content. As its name implies, long keepers store well. Properly stored, Long Keepers will last through the winter months... if you don't eat them first! Jubilee This is an All American selection. This low acid tomato is orange in color and very meaty. It keeps well in a cool, low humidity environment. Plants are indeterminate. Heirloom tomatoes are varieties that have been around for a long time, and their genetics have been kept pure (consistent). While this may not be a category in the true sense, there is a delicious heirloom variety that every home gardener should try at least once. Abe Lincoln Tomato - An excellent tomato. Brilliant red, round, medium sized tomatoes grown indeterminate vines. Dates back to at least 1920's. Ace 55 - This is a low acid tomato. Determinate vines produce good yields of meaty fruit, weighing up to 12 ounces. Amana Orange - Mild tasting,perfect for salads or slicing. It's golden orange color is beautiful mixed with red and yellow tomatoes. Exceptionally meaty, mediums sized and flavorful. Indeterminate plants. Aunt Ruby's German Green Tomato - Large, green beefsteak tomato. When ripe, fruit is green with a tint of yellow and a pink blush underneath. Baby Roma - This is a small, but mighty tomato variety. It has a powerful taste, that is great in salads and on vegetable platters. Indeterminate plants. Big Rainbow Tomato - This tomato has huge ribbed shoulders, and a golden color, with red running through the flesh. Plants are indeterminate. Black Krim Tomato - This is an old Russian heirloom tomato. The fruit is black with green shoulders. Plants are indeterminate. Brandywine Pink Tomato - This is one of the best heirloom varieties available. It is truly worth growing. Brandywine produces large, pinkish red fruit. Meaty, good tasting fruit growing 1 to 1 1/2 pounds on indeterminate plants. Brandywine Red Tomato -This deep red tomato has well-balanced flavor. Fruits average 8 ounces and are disease tolerant. Box Car Willie - It's a catchy name for a popular heirloom. Round, red fruits have a sweet tart flavor. Indeterminate, disease tolerant plants are heavy producers. Cherokee Purple Tomato - The smoky, sweet flavor of this beefsteak type tomato was enjoyed by Cherokee Indians over 100 years ago. Unusual color is certain to get attention at the serving table. Indeterminate vines. Crimson Cushion Beefsteak - Bright red and tasty ribbed fruit grow on vigorous vines. Great for slicing, sandwiches and relish trays. Indeterminate plant. A favorite and popular variety. Grow them and find out why. Old German - This beefsteak tomato is a deliciously sweet and decorative variety. Fruit color is yellow with red and pink mottling on the outside and throughout the flesh. It can weigh up to 2 pounds. Use it for fresh slicing, salads or salsa. Red Cherry Large - Vigorous, indeterminate vines grow abundant clusters of firm, round, cherry tomatoes, about 1 1/4" in diameter. Marglobe - Strong ,long producing, and vigorous vine produces medium sized, perfectly shaped. scarlet colored fruit. Solid flesh with mild acidity. use fresh or canned. 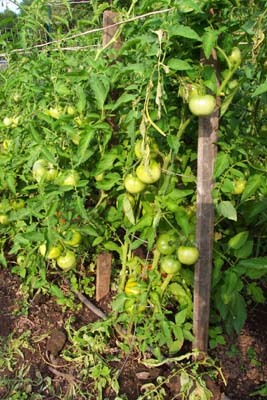 Mortgage Lifter Tomato - Produces a huge tomato, up to 2 pounds, that is very meaty with few seeds. As the story goes, a West Virginia man who produced and sold enough seedlings to pay off the mortgage of his house. Prudens Purple Tomato - Indeterminate "potato leaved" plants produce fruit up to 1 pound in weight. Fruit has dark pink skin and meaty, crimson flesh. Red Oxheart - A popular Italian, tomato variety. Indeterminate vines produce large, mild-flavored, strawberry shaped fruit, with few seeds. Excellent for canning and sauces. Yellow Pear - Grown since the late 1800's, Yellow pear produces an abundacne of small, yeallow, pear-shaped fruit, with a sweet flavor. Indeterminate plant. For tomato growers, one of the first two terms we learn is "determinate" and "indeterminate" vines, or plants. Determinate plants have a maximum height that the plant will grow. Some growers prefer determinate varieties, due to small gardens and confined space limitations, the desire not to fence or stake plants (small determinate varieties are perfect for this), difficulty of harvest, or a physical limitation (or handicap) of the grower. Indeterminate varieties are more common and more popular. The vines do not stop growing at any defined length or height. These varieties will require staking, caging, or fencing, to help support the vine as it grows and produces fruit. The plant continues to grow all season long. Indeterminate plants are limited only by the first frost.